NIMBioS education module: Fungus Among Us! 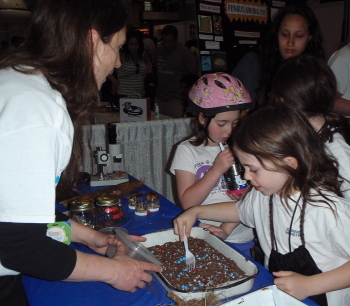 This module was done as a fun and interactive exhibit at the 2014 USA Science & Engineering Festival. Designed for kids, adults, and families to be shared in an informal environment, it introduces the idea of how fungi and plants can work together in a symbiotic relationship, via a game that includes collecting data and graphing. This module was designed with NIMBioS collaborator Courtney Patterson. Begin by asking the group what they know about fungi. Do any of them know that the mushrooms you eat are kinds of fungi? Next, ask what they know about plant roots. Where do they grow and what do they do? Here you might use the visual aid of real plant roots. 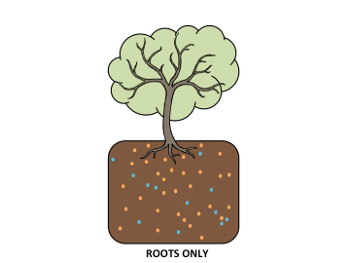 Explain that roots are the part of the plant that grows underground. 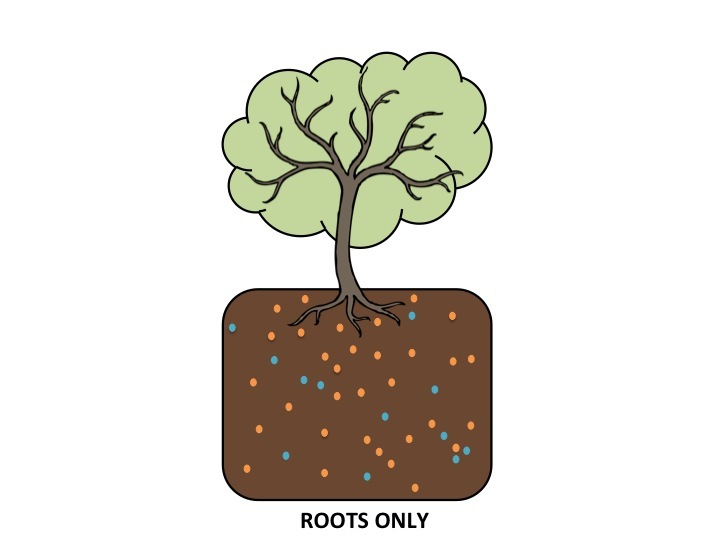 A plant needs roots so that it can find nutrients and water in the soil that help it to grow. Many roots have fungi that grow all over them, and the plant doesn't seem to mind one bit. Why might that be? Tell the group we are going to play a game that will show how fungi and plants work together. Hold up the capes and explain the differences (one is a plant, the other is a friendly fungus). Pick volunteers to be the plant and the fungus. For race or trial number 1, we will have Plant-volunteer try to collect beads mixed in a tray of potting soil. The plant-volunteer must use a fork to collect beads in a cup or bowl. Every bead he collects will count as 1 nutrient for the plant, which the plant needs to grow. Give him 20 seconds. Play the game and count the beads together. Write down the number. For race or trial number 2, Plant-volunteer and Fungus-volunteer will both collect beads at the same time, both using forks. They are going to work together to try and find as many nutrients in the soil as possible. Play again, collect the beads in the same bowl to count. Let's graph our data! 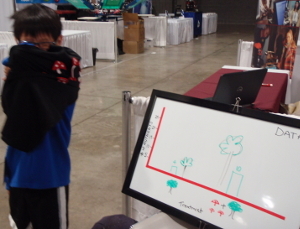 Bring the group over to the dry erase board and ask volunteers to draw a bar chart comparing the plant-alone trial to the plant+fungi trial. (Axis can be drawn on the board in advance, so that young children only need draw rectangles for each trial). Discuss the results. Ask which trial resulted in collecting more "nutrients:" when Plant-kid was alone, or when his fungus friend helped out? Ask why this happened. (We worked together!) This is what plants and fungi do, called a "symbiosis." Show the group the pictures below (Credit: C. Patterson), which show plants with roots only (left) and roots with fungal hyphae (right). Dots are nutrients, like the beads. 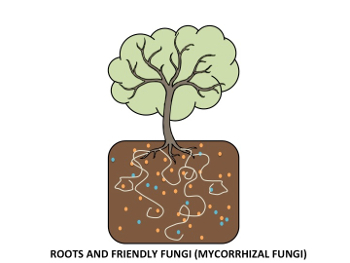 With the help of fungi, plants can explore more of the soil for nutrients. In return, fungi get sugar from the plant, which can photosynthesize those sugars using sunlight, air and water.